The Lux Meter Monitor Mavo USB is a lux meter to measure contact with luminous objects or illuminated surfaces. With the Lux Meter Monitor Mavo USB, the light density in screens, flat panel displays (CRT/LCD) tables, reflectors, signage, TV displays, traffic signs and displays can be measured. The luminance is classified according to DIN 5032/T7 and CIE no. 69. This Lux Meter Monitor Mavo USB is equipped with a USB port that can transmit measured values to a PC or a laptop. Transmitted values can be stored for later analysis. The handheld Lux Meter Monitor Mavo USB can be used in industry, service workshops and and for special controls and inspections according to existing prevention and safety norms, it is used specially in jobs that involve the use of screens in the fields of medicine and offices. 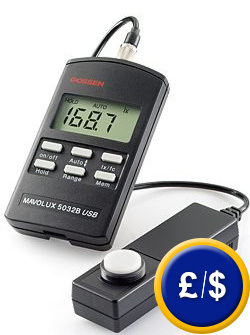 This lux meter Monitor Mavo USB uses the unit candle per square meter (cd/m²). Here you will find another lux meters without an interface. Certificate that guarantees the measured values; traceability via scientific light source type Wi 41 G (PTB Braunschweig, Germany).